J.B. Neumann, New York, by whom acquired from the artist on 23 September 1936. Galerie Nierendorf, New York, by whom acquired in the 1940s. Galka E. Scheyer, Los Angeles, until 1945. Milton Wichner, Los Angeles, until 1953. Anonymous sale, Christie's, New York, 15 November 1990, lot 139. Acquired at the above sale by present owner in 1996. The artist's handlist (no. 145, titled 'Schweres zwischen Leichtem Lourd entre léger' and dated 'vi 1924'). V. Endicott Barnett, Kandinsky Watercolours, Catalogue Raisonné, vol. II, 1922-1944, London, 1994, no. 703 (illustrated pp. 79, 110). Dresden, Galerie Neue Kunst Fides, October 1924. Wiesbaden, Neues Museum, Wassili Kandinsky, January - February 1925, no. 38. Barmen, Ruhmeshalle, Bauhausmeister, March 1925; this exhibition later travelled to Bochum, Gemäldegalerie, April 1925; Dusseldorf, Galerie Nierendorf, October - November 1925. Milan, Galleria del Milione, Kandinsky, April - May, 1934, no. 145. Dusseldorf, Kunstsammlung Nordrhein-Westfalen, Kandinsky. Kleine Freuden: Aquarelle und Zeichnungen, March - May 1992, no. 97 (illustrated); this exhibition later travelled to Stuttgart, Staatsgalerie, May - August 1992. Lugano, Museo Cantonale d'Arte, Kandinsky nelle collezioni Svizzere, June - October 1995, no. 30 (illustrated p. 185). 'The teaching of drawing at the Bauhaus is an education in looking, precise observation, and the precise representation not of the external appearance of an object, but of constructive elements, the laws that govern the forces (=tensions) that can be discovered in given objects and of their logical construction' (W. Kandinsky, "Analytisches Zeichnen", Bauhaus, 1928, quoted in K. C. Lindsay and P. Vergo, Wassily Kandinsky: Complete Writings on Art, Boston 1982, p. 729). Schweres Zwischen Leichtem ('Heavy between light') was executed by Kandinsky while he was teaching at the Weimar Bauhaus in June 1924. As its title suggests, this painting, like much of Kandinsky's work of this period, is an exercise in counterpoint that explores the tensions that are created by a carefully orchestrated composition of abstract geometric form and colour. Executed in the period when Kandinsky was practising what he would later effectively preach in his 1925 treatise on painterly elements Pünkt und Linie zu Fläche ('Point and line to plane'), Schweres Zwischen Leichtem is an extreme example that juxtaposes and contrasts the lightness of geometric elements, that have been composed against an infinite white background with the density that grounds such elements when they are arranged in front of and around a heavy material background such as that of the dark brown angular form at the centre of this composition. For Kandinsky, a successful arrangement of such forms into a stimulating composition was dependant on fixed but as yet unknown laws of dynamics and colour. Painting for him was not an end in itself, but a contributory organising force that could reveal these laws in action. An understanding of these laws would therefore not just result in the creation of successful and dynamic paintings but also become a path to understanding the hidden laws and nature and the spirit. Kandinsky belived that to understand the affinity between the elements and laws of nature and those of the arts, would pave the way for a synthesis of all arts of the spirit, and the ultimate transcendence of specialisation in the name of culture. This is essentially why he was at the Bauhaus, and why he taught many disciplines other then painting at the school. In Schweres Zwischen Leichtem Kandinsky has placed a heavy element at the centre of the page and articulated it by the careful arrangement of abstract form that surrounds it. 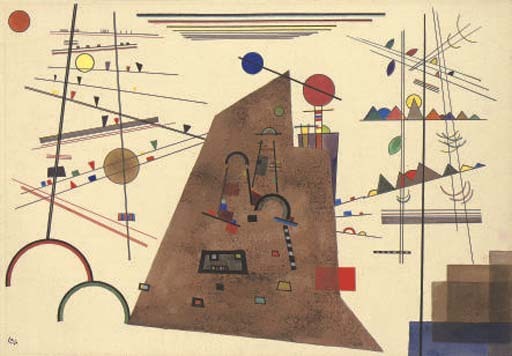 Kandinsky has maintained certain traditional pictorial conventions; a sense of depth and perspective is both suggested and subverted by the angles of the brown form and the seemingly receding horizontal lines at the top of the page. In addition, the progression of small coloured triangles to the left of the central form also encourages this sense as, like a line of musical notes, they seem to advance from the infinite expanse of white space of the painting's interior. The central dynamism of the picture remains however between the small close-knit forms of the 'heavy' element and the more open and harmonious elements of the 'light' areas, for it is this triangular contrast that establishes the counterpoint and central tension of this elegantly crafted work.